It is easy to lose or delete some files on OSX. In fact, most of us have experienced the disappointment of having a file get accidentally deleted and, before we realize it, we have emptied the trash. In the old days, there was not much you could do when it came to all things data recovery Mac. Fortunately, that is no longer the case. As Apple’s flagship operating system has evolved, so have your options for data recovery mac. 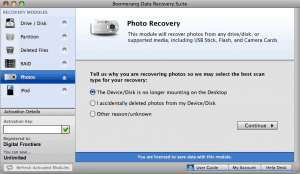 Let’s take a look at the type of data you can now recover on OSX. Documents, whether they were created in Pages, Garage Band, or any other standard Mac application can now be recovered. Your personal files are no longer subject to disappearing into the abyss when you inadvertently delete them, with an application that offers data recovery Mac. Even documents and complex files created by professional applications such as Final Cut and Logic Pro can be recovered if you are using the right file recovery software. Even old files that you have only now realized that you deleted a while back can be safely (and fully) recovered using the latest software specifically for that purpose. We all have plenty of photos on our Macs. We keep track of our lives in the photos we take. Sadly, you may have experienced the sinking feeling of realizing that you have deleted some cherished photos that you truly wanted to keep. In the past, these photos were lost to the sands of time, but that is no longer the way that it has to be. Due to the unique way OSX handles programs (wherein applications are just installed and then deleted, basically), you may accidentally delete an application that you would like to get back. As long as you have a valid user license for the application, data recovery mac can help you get your lost or deleted programs back with ease. Sometimes, you simply need to temporarily bring back a deleted program to access an old file you have not needed to open lately. In this situation, data recovery can help you restore the application and you can delete it again later!